Great buy. Colors are bright just like pictures, but not cheap looking. Bought for a nursing home resident and everyone commented how cheery and nice it looked. Overstock offers so much variety to choose from compared to my local shopping . Reinvent your room with the Sybil Quilt Set by Windsor home. Add flare to any bedroom with bright colors and bold patterns. 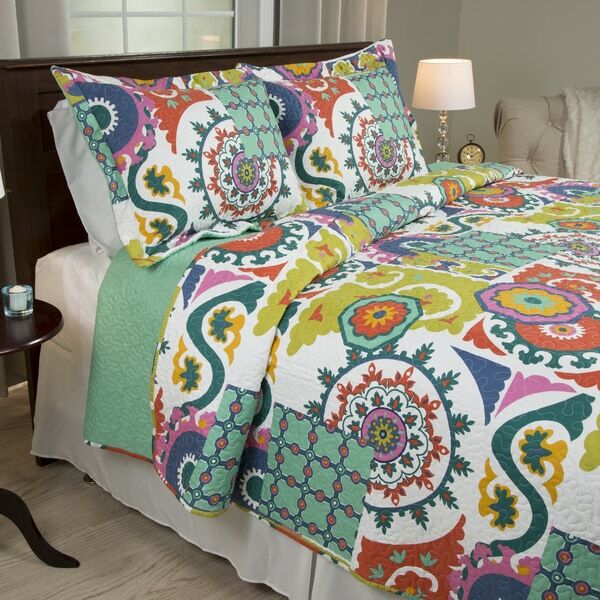 The soft microfiber quilt features a Moroccan print in bright, bold colors, creating the perfect boho chic bedroom set. I purchase this quilt for my granddaughter and she was delighted when she received it. The quilt is very colorful and to our surprise her throw pillows matched perfectly. The only complaint about the quilt is it was almost too short for for her bed. I ordered the full/queen and her bed is queen, other than that she is well pleased with her quilt. This quilt we use constantly in our motel. Customers love the bright trendy colors and we love the wonderful on-line reviews we received from all your beautiful quilts. Bright cheery you will never grow weary of the colors in here. Matches to SO many Sykes. Get it and have a ball, party or sleepover too. I just liked it as a single twin! Guru, take this home with you! This product is substantially heavy too. Very nice weight. I love these Quilts - bought 4 for our double bunk room, and they just make the room pop. The quality is great, and they go well with solid color pillows and white furniture. Nice value. I like this quilt, very fun pattern. Very pretty and colorful. However it is shorter in size then I expected. Nice quality and colors are great! ridiculously thin!! Like a sheet. Not happy at all. Beautiful! And a great bargain!! "What kind of fabric is this quilt made of?" The outside is polyester and cotton fill.